Do you believe in faeries? An interesting question, how many of us have left money under our pillows as children for the tooth faerie? How many people were duped by the Cottingley fairy hoax? 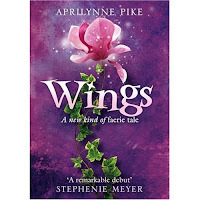 Aprillynne Pike sets out in her début novel, Wings, to try and breath new life into the Fae myth. One of the difficulties I think the young adult fantasy author faces is to successfully merge the real and usually mundane with the fantastical and usually more interesting part of their story. This is something Aprillynne Pike manages this quite well. The book focuses on our main character, Laurel, who, having been home-schooled until she was 15, has just become the new girl at college. It deals with how she copes with this new environment and then having managed to settle in at school how her life is turned upside down in more ways than one. The well crafted story is easy to follow and well written, the main characters are well formed and believable which is a feet considering the nature (punn intended - read the book) of some of the characters. Although a little too short for my liking, the book grabbed me drew me in and made me want to finish it. Part of it's charm is the journey of discovery you are taken as Laurel discovers more about herself and her history. Thrown into the mixing pot are family worries, boy troubles, and general teenage angst. The story ending is well crafted and cleverly leaves the story open for a sequal. In fact there are hints thorughout the book of more to come. Several characters are barely touched upon, the fantastical world is only glimpsed, the story truely has only just begun. I won't spoil the book for you but there is one small part of the book, an explanation about a certain facet of the story, that I think doesn't really work. I understand why it is the way the author made it that way but the explanation doesn't work for me when everything else does. To sum up this was a thoroughly enjoyable if a little too short for my liking and I'm looking forward to reading the sequals.